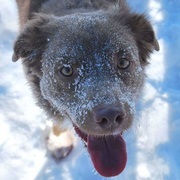 AROO~ Australian Shepherd Rescue of Ontario is a registered Not-for-Profit Corporation under the Canada Not-For-Profit Corporations Act (registration number 848437-6). (1) SUPPORT and educate the owners of Australian Shepherds and/or Aussie mixes by helping them deal with any issues and solve any problems which may arise. (2) WORK with our team of volunteers to rescue those Australian Shepherds and/or Aussie mixes who meet a set of basic criteria. AROO needs the help of many people in many ways to support our organization. (1) DONATIONS: Quality dog food and treats; blankets and towels; doggie crates and beds; collars, leashes and harnesses; brushes, shampoos and grooming needs; dog dishes, toys and kongs; gift certificates to pet stores. (2) FINANCIAL SUPPORT: As a not-for-profit organization, we require ongoing funding to provide our dogs with the best of care.You can contribute to AROO by clicking the "donate" button at the top of the page. No donation is too small, and on behalf of our dogs, we thank you for your generosity. (3) FOSTERING: If you have room in your heart and in your home, consider taking in one of our Aussies in need.until a permanent home can be found. (4) VOLUNTEERING: Volunteers are the backbone of any rescue organization, and we couldn’t exist without your invaluable dedication, commitment and assistance. Walk & Raise Money-It costs you Nothing!